UI-wise, the Exit popup can now be turned off and replaced with a simple back button double-tap, which finally lets you easily exit the browser by interacting with just a single button. As before, you can also hold the back button to exit at any point, which is probably my favorite featured compared to the stock browser. I'm glad to report that v7.2 fixes another privacy issue that was spotted by one of our readers (thanks, TOMMMMMM) - on-demand backups that were previously written to SD in a completely unencrypted form wide open to any malicious app are now password-protected. 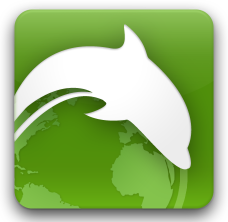 It's good to see the Dolphin team pay close attention to such privacy issues. The rest of the fixes are related to various stability, performance , Dolphin Connect, and settings. Check out the full changelog below, then grab the update form the Market.